Today when I came from home, I was way too tired to cook something from scratch. So I always buy and keep these instant pulav mixes. 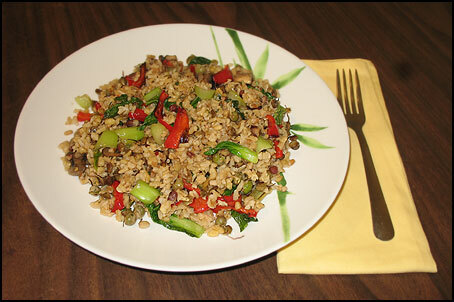 This whole grain blend is very nutritious and very easy to cook. This blend contains Bulgar, brown rice, whole grain rice, and other grains. One box is enough for two people for a main meal. It comes in different flavors. One box contains whole grain blends and a pouch which has the spice and flavor mix. So if you would like to use your own spices, you can do so instead of using the pouch that comes in the box. I bought the roasted garlic pecan flavored blend. The spice pouch contains the spice mix with chopped pecans. Cook whole grain blends according to package directions and leave aside. In the meantime wash and drain sprouted beans. Add oil to a skillet and once hot add sprouted beans and saute for about 3 minutes. Add Bok-Choy leaves and saute for one minute (Bok-Choy leaves wilt very quickly. So don’t saute for too long). Mix cooked whole grain blends into the vegetable mixture and leave aside for about 10 minutes for the flavors to develop. Note: When sauteing vegetables, you don’t need to add salt to the vegetables since the spice pouch has salt in it. So after mixing the vegetables into the whole grain blends, leave for a while so the salt will be absorbed into the vegetables. Leaving for a while also enhances the flavor. take care..your recipes are always YUMMY! !